Jews in Sports – From Sandy Koufax to Omri Casspi and everyone in between, learn how Jews dominated the playing field, along with some trials and tribulations the Jewish athletes had to face on their way to the gold. Jews in Media—How are Jews portrayed in movies and television? Are the portraits accurate? Using popular television shows and movies, we will look at what they teach us about being Jewish and what image non-Jews get of the Jewish people. We will use contemporary and older movies, as well as current releases and television shows! Craft Art ­- Experiment. Shape. Discover your roots through the use of a variety of artistic media in a learner-friendly environment. A wonderful opportunity to utilize your creativity! Step in Time – Dance your Sunday mornings away! Learn the best of Israel’s new and hippest songs and dances, and enjoy your old favorites. Snapshot – Discover tools for a deeper understanding on how to view and create photographs with an emphasis on feeling composition, seeing light and of course exploring your Judaism. Tastes mmm… – Do you love cooking? Ever wish you could participate in a cooking competition? Expand your culinary repertoire as you explore the tastes of Kosher and Jewish cooking from all over the world. This class will be limited to cold foods only. The Partnership Program class will be available to 9th Grade students as an elective in January 2016. The School Twinning Program, sponsored by the Jewish Federation, is an exchange between teenagers from Ironi Dalet High School in Tel Aviv and our Los Angeles Hebrew High School Students. They join together for the first time in April when the Israelis visit Los Angeles to experience Jewish pluralism. 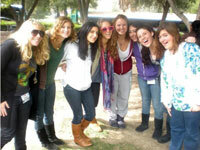 The Israelis stay with LA Hebrew High host families, learn about each other’s culture, religious practices, and daily life. In December, a delegation from Hebrew High visits Tel Aviv, reuniting with their partners and having the opportunity to understand Israeli culture and history.